Our suites located in the village Amirim in the upper Galilee, between the cities Karmiel and Safed. The fastest way from the center of Israel: drive along Route 2 until you reach interchanges Zichron Yaakov. then drive towards Haifa on route 70 until you reach Yagur Junction. Then turn right until Ahihud junction, then turn right to route 85 (direction Safed city) until you reach Hanania junction. There take a left on Route 866 towards Safed. 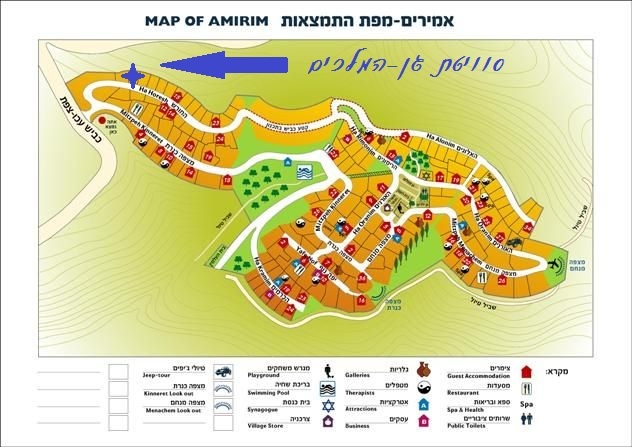 After about 4 KM you will reach Amirim village. Entrance to the town, immediately after you turn left guard position. The suite is the second house on the left.